I really hope Ayelet Waldman sticks to writing literature. 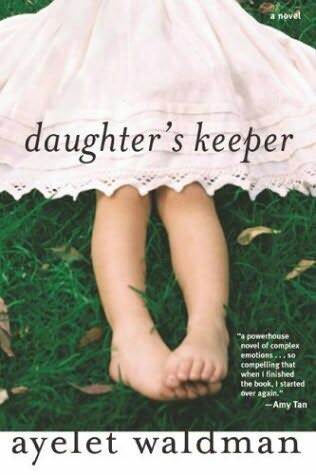 As her first stand-alone novel, Daughter's Keeper will keep you addicted from start to finish, with Waldman's experience as a defense attorney really coming to light in a very creative way. Having read 100% of Waldman's work to date, I highly recommend bypassing her "Mommy-Track" cozy mystery series and dedicating your time and energy to not only reading Daughter's Keeper , but Love and Other Impossible Pursuits (2005) and Red Hook Road (2010). Daughter's Keeper is about a young and once-highly ambitious woman named Olivia who supports her boyfriend and illegal alien Jorge as he can rarely obtain work as a day-laborer. Fluent in Spanish and incredibly educated, Olivia even questions her own loyalty to this seemingly worthless-boyfriend. When Jorge becomes involved in a major drug-deal to help support them better, both Olivia and Jorge are busted in an undercover operation set up by the DEA. Adament about her detached involvement in the drug-trafficking, Olivia must face trial and the possibility of spending several years in prison. In addition to this general plot detailed above, there is much, much more to Daughter's Keeper . Supporting characters include Olivia's mother Elaine, who has a distant and detached relationship with her daughter; Arthur, Elaine's boyfriend and fiancee of several years; and Izaya, Olivia's ambitious and successful defense lawyer. With this particular ensemble of characters, we learn more about how our emotions, feelings and passions for "doing the right thing" overcomes all else in life, and how one must weigh in the little things when grander, more important events and struggles are taking place. Waldman takes a fascinating approach to common perceptions and human rights in regards to multiple nationalities. We learn every side of the story as told by white Olivia, hispanic Jorge, and half-black/half-jewish Izaya. As a reader, I've taken away more knowledge on how the government systems work and also gained more insight on the struggles a young, educated hispanic man will face crossing the border from Mexico into America illegally. For younger adults specifically, Daughter's Keeper will appeal to readers struggling with making the right decisions, and this novel is the perfect example of the bad consequences that befall those who are misguided. It's such a sad story that Olivia makes, with her being unsure why she's supporting Jorge when she doesn't necessarily love him. It makes one question why we insist on trying to convince ourselves we're happy when we're genuinely not. I'm happy to say I enjoyed Daughter's Keeper so much that I devoured it within a ten-hour time period, given I took a break to sleep. I highly recommend this and other works by Waldman!